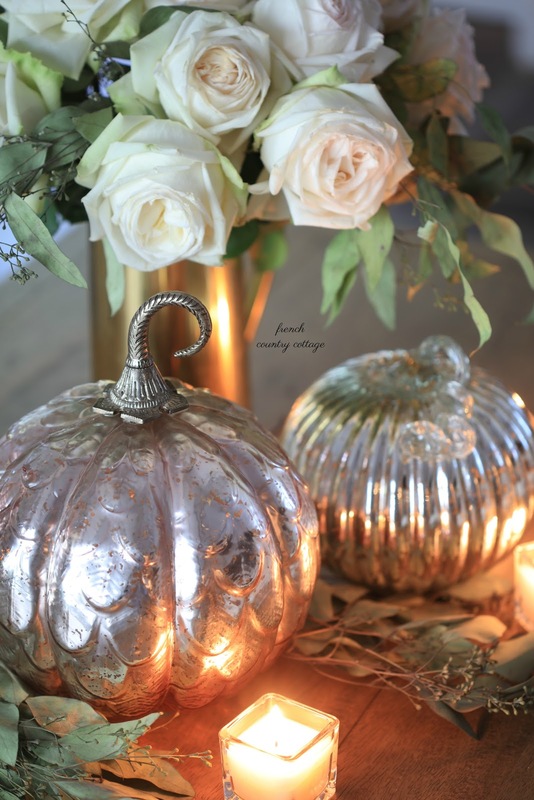 Pretty little mercury glass pumpkins - The other day I was wandering along minding my own business while shopping HomeGoods... when it happened. It was in the seasonal aisle. Tucked behind the velvet pumpkins and bits of wheat and even little bitty felt acorns. But it couldn't hide from me. and knew, I had to see what it was. What it was- was a treasure. And there were several of them- which made it kind of like a treasure trove. This treasure had a charming romantic fairytale feeling. Something straight out of Cinderella with all that pretty barely blushing and silver mottled glass. The most adorable little mercury glass pumpkins with curly q stems and pretty little details. And I couldn't leave them behind. Especially when I noticed something else. Here is what the pumpkins look like top to bottom- do you see what I see? They look like huge Christmas baubles just waiting to be placed on the tree. So, I call that dual decorating potential. And yes, they came home with me. It would have been a crime to leave that little mercury glass pumpkin patch behind don't you think? 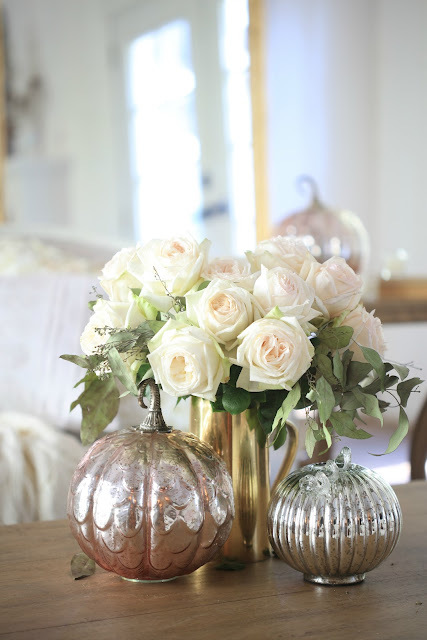 my post over at the HomeGoods blog. So what do yo think? Would these little mercury glass charmers have come home with you? They are so adorable and I like how you put the tealight in front of them. It does make them look fairytale. They would have come home with me too! They remind me of Balsam's French Country Christmas ornaments. Love! We don't see these in New Zealand, pity as they are gorgeous!! Yes, mercury pumpkins are so delightful. 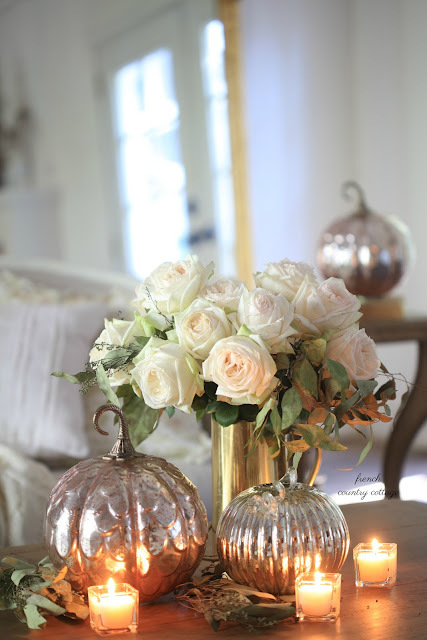 I love mercury glass everything especially with candles nearby....I love the muted sparkle and shine! Very pretty, Courtney! I LOVE Mercury Glass! 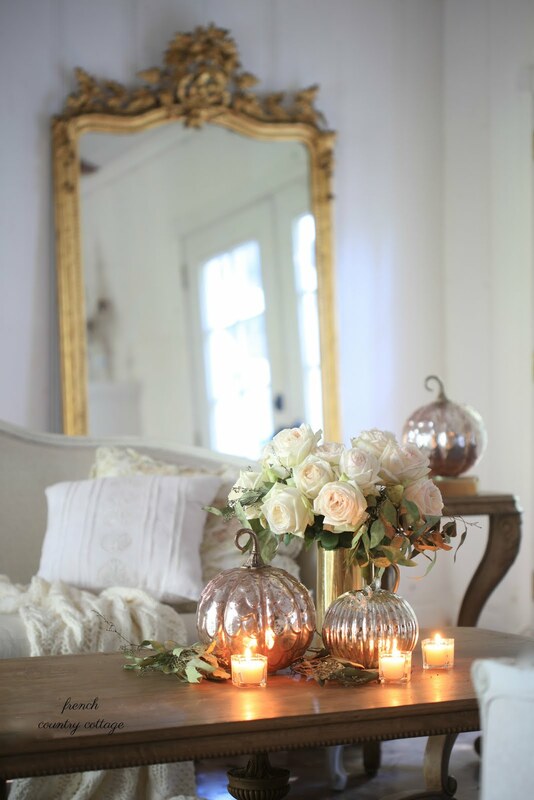 These are enchanting - I could imagine them being the beautiful little pumpkins Cinderella's fairy Godmother would use...they glimmer in the candlelight! Hi Courtney, oh ya! They would have come home with me and probably a few other things as well! They look amazing! Have a wonderful day. LOVE that look. Got a HG gift card from my MIL yesterday for my birthday. Time to go shopping! GREAT idea about dual use of these beauties. Enjoyed your HG articles, too. I saw your pictures & love it ! I went to T.J.Maxx and got that glass pumpkin. I'm so happy.